Billie is a shining star. She is certain to turn heads and hearts with her silhouette as she holds the body like a silken glove. The is so luxurious and available here in the softest eyelash lace that caresses your curves so beautifully, you will light up the night. Her lace frill that frames her plunging low back is so soft and feminine and conveniently removable to give an option of a different look. Her high neck gives her a distinguished feel that holds the attention of the room and her buttons trail down to captivate all who stand behind. 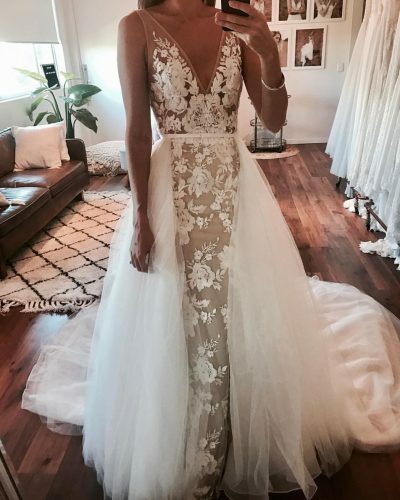 Billie is available to purchase in French crepe or French lace and her waterfall lace on her back is removable so you can have two looks on your wedding day!